Are your kids as fascinated with the moon as mine are? 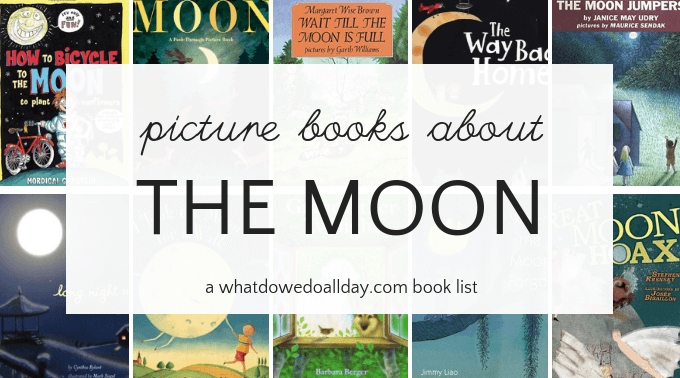 If so, then you need to put these children’s books about the moon on your reading list. Stat. 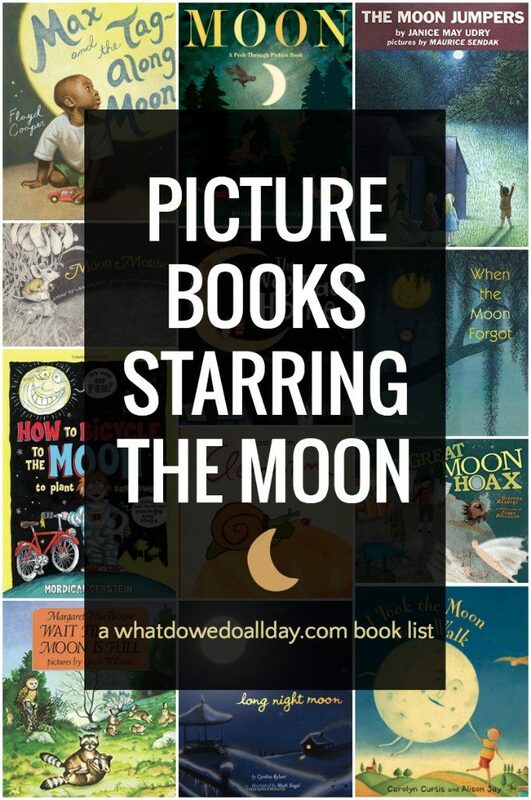 This list of children’s picture books about the moon is about looking at the moon through an imaginative lens. When reading these children’s books your kids will certainly learn a few facts about the moon, but that is not the focus of these moon books. We humans have long woven myths and folktales around that gleaming silver globe in the sky. (Oooh, dear. Stop me before I reveal what a truly purple writer I am.) I’ve focused primarily on stories which draw upon our collective attraction to the moon as a thing of mystery, beauty and inspiration rather than books with scientific explanations. Moon: A Peek-Through Picture Book by Britta Teckentrup. This wonderful picture book uses die-cut pages to show the changing moon as it shines down on different environments around the world. The rhyming text will delight children and adults alike. Lovely! Wait Till the Moon Is Full by Margaret Wise Brown. This collaboration from classic author and illustrator Margaret Wise Brown and Garth Williams was a childhood favorite of mine. A young raccoon tells his mom he wants to go out at night and know the night things, like owls and “how dark is the dark.” The mother raccoon, however, tells her little one that he needs to “Wait. Wait till the moon is full,” before he can go out and play with his friends. When — finally — the moon is full, the nocturnal joy of the animals will infect you. Don’t miss it. Max and the Tag-Along Moon by Floyd Cooper. This story reminds me so much of my childhood, when I would watch the moon from the car window just like Max! After he says goodbye to his Grandpa, Max watches the moon following him on the car ride home. The moon passes behind trees, over bridges, along the ridge of hills. He wonders if the moon will always be there for him, just like his Grandpa told him it would be. Floyd Coopers illustrations are gorgeous. This is a wonderful book. Mordicai Gerstein. This new book is part picture book, part graphic novel with deadpan humor and will appeal to kids with a sense of adventure and a love of inventions. A creative boy decides to get to the moon, by bike! And he does! All it takes is a very long garden hose, a bicycle and a huge imagination. Great fun. The Way Back Home byOliver Jeffers. A boy finds an airplane in his closet and decides it’s the perfect vehicle to take him to space. When he crashes on the moon he meets an equally intrepid Martian who also needs help getting his ship started again. This is a charming story of friendship and cooperation. The Moon Jumpers by Janice May Udry. Alternating between black and white illustrations with text and wordless color two page spreads, this 1959 classic follows the nighttime adventures of a group of siblings as they romp outdoors under a full moon. It beautifully explores the imaginative power of free play. Long Night Moon by Cynthia Rylant. Rylant takes the reader on a lovely quiet tour of all the calendar names for the monthly moons. She begins with the Stormy Moon of January and ends with the Long Night Moon of December. Why the Sun and the Moon Live in the Sky. A wonderful porquoi tale. Water wonders why he is never invited to Sun’s house. Sun replies that his house is not large enough and sets out building a new one to accommodate his friend. But when water comes to visit, he fills the entire house and there is no longer room enough for Sun and his spouse, Moon. Can you guess where they found a new home? I particularly like the illustrations, with their emphasis on the mask. Red Knit Cap Girl by Naoko Stoop. Red Knit Cap Girl is searching for the moon. She wants to talk to it and is joined on her journey by a few woodland friends. A lovely story about finding the beauty around us. The Great Moon Hoax by Stephen Krensky. Based on a real story about a real hoax that perfectly captures the public’s desire to imagine extraordinary happenings in outer space. In the summer of 1835, Jake and Charlie are paperboys for The Sun when the paper starts to print wild stories about what a South African astronomer sees on the moon through his telescope. Really strange stuff: blue bearded bison, moon beavers, man-bats! It’s pretty amazing to think that people believed the stories! This book is not perfect, but I’m including it because my son and I found it so interesting and it sparked an great conversation about truth and propaganda. Want to chat with your kids about how the media blows events out of proportion? This book might be a good starting point. Grandfather Twilight by Barbara Helen Berger. A mostly wordless book, this is a good choice for bedtime as the overall pace and tone of the book radiates peace and gentleness. My kids liked this when they were younger and were fascinated by the illustrations of the moon growing from a pearl. When the Moon Forgot. I first discovered this book because I loved Jimmy Liao’s book, Sound of Colors. A lonely boy finds the moon in a pond. He fishes it out with his butterfly net and takes it home. Around him, the people wonder what has happened to the moon and they start to manufacture substitutes. Meanwhile, the boy nurtures the real moon until it is time for it to return to the sky. There aren’t too many kids books translated from the Chinese, and this one is worth the read. I Took the Moon for a Walk by Carolyn Curtis. Much of my love for this book is a result of Alison Jay’s illustrations. Admittedly, I am a fan of her style. The text, too, is gentle and who doesn’t imagine the moon following after him in the sky. It certainly seems that way to me sometimes. Moon Mouse. We have a vintage copy of this out-of-print title and oh, how it made my then-4 year old laugh and laugh that the mouse thought he found a way to taste the moon made of cheese. See if your library has a copy or pick up a used version! Clementine by Sebastian Loth. Clementine the snail loves all things round so she and her earthworm friend, Paul, decide to build a rocket to launch her to the round, round moon. On her journey though space she discovers, to her utter delight, that the earth is also round! Try adding in these moon facts during your read aloud time! Kitten’s First Full Moon – Kevin Henkes. The black and white pictures are absolutely stunning. And my boys alternately giggle at Kitten’s misadventures. The Moon – text by Robert Louis Stevenson, pictures by Tracey Campbell Pearson. We LOVE this book. It’s an illustrated poem and cleverly and gently shows a father and young son take a special nighttime journey. Very gentle, but with lots of details in the pictures, it’s the perfect multiage bedtime story! LOVE. Oh, yes, we love Kitten’s First Full Moon, too. Great suggestion. I don’t know The Moon by RLS, but it sounds great. I will have to look it up. Thanks for the suggestion. This is a great list, but what about that old favorite Good Night, Moon? We had to say good night to the moon for ages when my Kiddo was young. She loved that book so much we all had it memorized from reading it so much. Yes, that’s certainly a classic! I think every parent must know it by heart. 🙂 Sometimes I leave books off a list because they are so well known and I want to make room for others. Thanks for mentioning it. Have you read JimmyZangwow’s Out of this world moon pie adventure? It isn’t about the moon, but the moon is a character in the book. It is a really cute story that both my girls and I (well, and my husband) all enjoy. That is a new one for me. I’ll have to get a copy. Thanks for the suggestion. One of my favorite moon books is THE MOON IN MY ROOM, by Uri Shulevitz — very simple and lovely, about a boy’s room, which contains “the whole world”. How did I miss that one. I love Uri Shulevitz! I second Kitten’s First Full Moon. Also, in Owl at Home by Arnold Lobel, one of the stories is about the moon and how Owl thinks it is following him. Owl at Home is a good one! I forgot about that. I thought of “Kitten’s First Full Moon” reading this post, too. I’ve only read the last one from your list – will have to look for the others! All marvelous choices – so nice to have them in one spot. Yes, an excellent addition to the list, Cathy! I forgot about Round is a Mooncake – Grace Lin is one of my favorites. I only have read one of your moon book suggestions so now I’m raring to read the entire list! But I do love Red Knit Cap Girl!! Eek! We have only read one book from this list (Red Knit Cap Girl), although I’ve been meaning to check out the Oliver Jeffers one. I agree with everyone else who has mentioned Kitten’s First Full Moon…that’s one of our favorites. This is such a great list, and I can’t wait to check them all out (unfortunately my hold list is full right now, so these’ll have to wait for next week!). I haven’t read Moongame, but Asch’s Moon Bear is fun, too. And like Carle’s book, too. Great suggestion. I love the moon. This is such a great list. I Took the Moon for a Walk is one of my most favorite books. Have you ever read The Tear Thief by Carol Ann Duffy? http://bit.ly/QiGxZM The tears make up the moon’s light. So whimsical and moonly magical! Awesome activities too btw! Thanks. I love finding more books to read outside under the moon for bedtime. I don’t know that one. Thanks for the suggestion, Colleen. My immediate thought was of The Owl Moon – I thought I’d see it on the list. We also read a picture book by Grace Lin about Harvest Moon and Moon festival, but the name escapes me at the moment. Thanks for mentioning Willoughby, Suzy. That’s another great choice. My 4 year old loves that book, too. LOVE! Adore! Esp the Garth Williams/Margaret Wise Brown book. It is GLORIOUS! Love this list to pieces! I agree, it IS a glorious book!